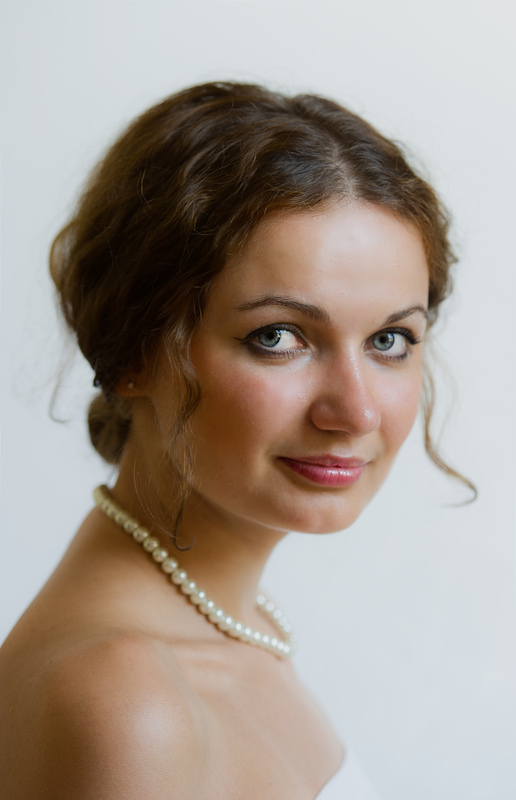 Ukrainian mezzo-soprano - Anna Starushkevych has graduated from the International Opera Course at the Guildhall School of Music and Drama in London, studying with Laura Sarti. Anna also is privileged to be working on her repertoire with Dennis O’Neill and Teresa Berganza. Before her studies in the UK, Anna studied singing at the Lviv National Academy of Music and the Lviv State Music College in Ukraine with a renowned Ukrainian bass - Vasyl Dudar. Anna has become the first mezzo-soprano to win the Handel Singing Competition in London in 2012, taking the first prize (the Adair Prize), the Audience Prize and the York Early Music Prize. This followed winning the Susan Longfield Award and third prize in the Jackdaws Vocal Award at the Wigmore Hall in 2010. She returned to the Wigmore Hall to perform the role of St Mary Cleophas in Handel’s La Resurrezione for the Handel Festival 2013. Success in competitions also includes winning the Bampton Classical Opera Young Singers’ Competition 2013 and becoming a finalist in the Kathleen Ferrier Competition 2013. Spring of 2017 has brought out the releases of two special CD works - Anna recorded one of the principal roles in Handel's Ottone on Decca Classics, as well as the much anticipated Pavel Haas CD Fata Morgana, recorded together with a renowned pianist - Lada Valešová, which was released on Resonus Classics. Performances of the Spring were no less exciting, to include the solo in Prokofiev's Alexander Nevsky, performing with the Royal Philharmonic Orchestra and the Royal Choral Society under Richard Cooke at the famous Winchester Cathedral, taking on a part of Phanor in Handel's Joseph and his Brethren at the London Handel Festival with superb Laurence Cummings, as well as returning to the International Festival of Organ and Chamber Music in Anna's native city - Lviv, performing the atmospheric Nisi Dominus by Vivaldi. In June 2015 the mezzo was nominated for the Best Female Supporting Role in an opera at the Helpmann Awards (Sydney, Australia) for her performance of the role of Rosimonda in Handel’s Faramondo at the Brisbane Baroque Festival 2015. In September 2015 Anna was granted the UK Exceptional Talent Migrant Visa. The mezzo-soprano performed the role of Ofelia in Salieri's La grotta di Trofonio for the Bampton Classical Opera 2015, Orlofsky in Die Fledermaus for the Celebrate Voice Festival 2014 in Salisbury, as well as the role of Erato in Gluck's Il parnaso confuso and Orfeo in Bertoni's Orfeo for the Bampton Classical Opera 2014 season. Earlier that season she joined the Göttingen International Handel Festival in Germany as Rosimonda in Handel’s opera Faramondo, which was recorded by Accent Records. During her studies on the International Opera Course at the Guildhall School of Music and Drama, Anna has performed the title role in The Adventures of Pinocchio by Jonathan Dove and Cherubino in Le Nozze di Figaro by Mozart. Other operatic highlights include a principal role in a new project, Handel Furioso, for the Grimeborn Festivals 2012/13 and Junon in Charpentier’s Actéon at the Wigmore Hall with the Theatre of the Ayre. In July 2012 Anna was chosen to attend the Georg Solti Accademia di Bel Canto in Castiglione della Pescaia (Italy) where she had the opportunity to work with some of the world’s leading performers such as Richard Bonynge, Angela Gheorghiu and Dennis O’Neill. Anna has also had the good fortune to work with leading conductors and directors such as Laurence Cummings, Erin Helyard, Paul Curran, Stephen Barlow, Martin Lloyd-Evans and Max Hoehn, as well as coaches including Phillip Thomas, Susan Stranders, Elizabeth Rowe, Eugene Asti and Lada Valesova. Anna has also given solo recitals and performed in concerts in Austria, Belgium, Switzerland, Italy and Ukraine. In the UK she has sung in concerts at the Wigmore Hall, Barbican Hall, St George’s Hanover Square, St Martin-in-the-Fields, Milton Court Concert Hall and LSO St Luke’s. Anna also performs regularly in oratorio, including Handel’s Messiah, Mendelssohn’s Eliah, Mozart’s Requiem and Stabat Mater by both Haydn and Pergolesi. Anna’s other recordings include the Accent Records CD of Handel’s Faramondo (Rosimonda) live from the Gottingen International Handel Festival 2014, as well as a solo performance on BBC Four’s DVD Maestro or Mephisto – the real Georg Solti. Anna is grateful for the generous support of her studies to Andrian Mostovyi (Split Lviv) and Serena Fenwick.